They covered Joe Cocker's cover of a Beatles tune "because we're all Zeppelin freaks". Some years ago there was a club at the corner of Broadway and Kingsway known as Vancouver's Tonite–one of the Top Three local clubs along with Frams and Outlaws where nasty guitar licks and heavy sounds were the stock-in-trade. And one of the heaviest bands ever to grace the stage was a Vancouver-based quintet called Kick Axe. 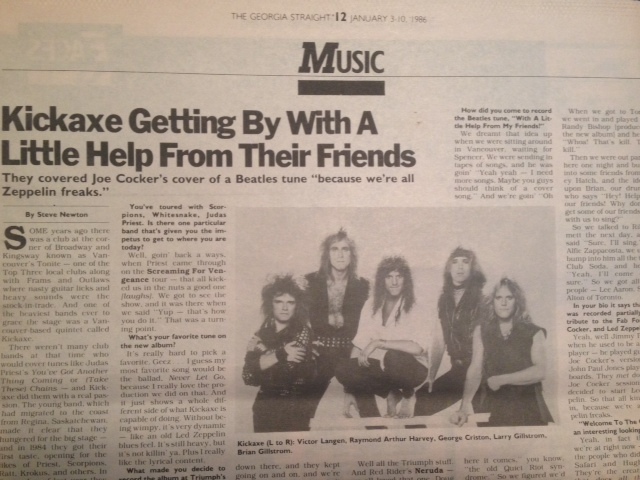 There weren't many club bands at that time who would cover tunes like Judas Priest's "You've Got Another Thing Comin'" or "(Take These) Chains"–and Kick Axe did them with a real passion. The young band, which had migrated to the coast from Regina, Saskatchewan, made it clear that they hungered for the big stage–and in 1984 they got their first taste, opening for the likes of Priest, Scorpions, Ratt, Krokus, and others. In September of last year they played the Pacific Coliseum with Whitesnake and Quiet Riot. On the eve of 1986, Kick Axe have released their second album, Welcome to the Club, and are preparing for a cross-country tour–as headliners this time. With the new album already halfway to gold status in Canada–in spite of an apparent blackout locally–and with steady airplay back east of the first single–a cover of the Beatles' "With a Little Help From My Friends"–things are looking good for the band: singer George Criston, guitarists Larry Gillstrom and Raymond Arthur Harvey, drummer Brian Gillstrom, and bassist Victor Langen. During a break at a photo session in Toronto last week, Langen called the Straight, and talked about the new album, the single, and singer Criston's dislike of shoes. You're going to be starting a cross-Canada tour, but from what I understand, Kick Axe won't be playing Vancouver. Nope. There isn't much reason to. I don't know if you're aware of it or not, but CFOX has taken it upon themselves to ignore that we exist–whereas the rest of the country is onto us. We have more dates than we know what to do with–without even coming in to Vancouver–so we're just gonna go where people want us. Well the tour starts on New Year's Eve in Lethbridge. Then we go up to Edmonton on the first, Calgary on the second, Red Deer on the third, Grand Prairie on the fourth–and then back down to Medicine Hat, and so on. We've got White Wolf coming out as an opening act, and we've got Labatt's Breweries producing the whole tour–they're our financial backers on the whole deal. So it's a national tour. It would have been coast-to-coast if we had got some radio play out there [in Vancouver]. You've toured with Scorpions, Whitesnake, Judas Priest. Is there one particular band that's given you the impetus to get to where you are today? Well, goin' back a ways, when Priest came through on the Screaming for Vengeance tour–that all kicked us in the nuts a good one [laughs]. We got to see the show, and it was there when we said, "Yup–that's how you do it." That was a turning point. What's your favourite tune on the new album? It's really hard to pick a favourite. Geez…I guess my most favourite song would be the ballad, "Never Let Go", because I really love the production we did on that. And it just shows a whole different side of what Kick Axe is capable of doing. Without being wimpy, it's very dynamic–like an old Led Zeppelin blues feel. It's still heavy, but it's not killin' ya. Plus I really like the lyrical content. What made you decide to record the album at Triumph's Metalworks studio in Toronto? Well our manager has been good friends with them since they started out. And we couldn't get into Pasha [producer Spencer Proffer's studio in L.A.]. W.A.S.P. was down there, and they kept going on and on, and we're not the kinda guys to just sit around, so we said "Well Spencer we're makin' the record without ya." Had you heard any records that were made at Metalworks before? Well all the Triumph stuff. And Red Rider's Neruda–we all loved that one. Doug and the Slugs did Cognac and Bologna there I believe. And a lot of work of Platinum Blonde's last album was done in there–we heard advance tapes of that. How did you come to record the Beatles tune, "With a Little Help From My Friends"? We dreamt that idea up when we were sitting around in Vancouver, waiting for Spencer. We were sending in tapes of songs, and he was goin' "Yeah, yeah–I need more songs. Maybe you guys should think of a cover song." And we're goin' "Oh here it comes," you know, "the old Quiet Riot syndrome." So we figured we'd beat him to the punch. We didn't want him pickin' some song that we all would absolutely hate. So we came up with "A Little Help From My Friends". When we got to Toronto we went in and played it for Randy Bishop [producer of the new album] and he goes "Whoa! That's kill. That's kill." Then we were out partying here one night and bumped into some friends from Coney Hatch, and the idea hit upon Brian, our drummer, who says "Hey! Help from our friends! Why don't we get some of our friends down with us to sing?" So we talked to Rik Emmett the next day, and he said "Sure, I'll sing." And Alfie Zappacosta, we used to bump into him all the time at Club Soda, and he said "Yeah, I'll come down, sure." So we got all these people–Lee Aaron, Sheron Alton of Toronto. In your bio it says that song was recorded partially as a tribute to the Fab Four, Joe Cocker, and Led Zeppelin. Yeah, well Jimmy Page–when he used to be a studio player–he played guitar on Joe Cocker's version, and John Paul Jones played keyboards. They met doing the Joe Cocker sessions, and decided to start Led Zeppelin. So that all kinda ties in, because we're all Zeppelin freaks. Welcome to the Club has an interesting looking cover. Yeah, in fact the place we're at right now–they're the people who did it. Dimo Safari and Hugh Syme. They're the creative team that does all the Rush covers. Who's the little blonde kid on the front and back? He's a young, young model that we found here in Toronto. He symbolizes rock and roll, you know, like in "Hellraisers"–"Every mother's child was born to be a hellraiser." I mean, everybody's a party animal if you just get it out of 'em. Does George still pull that Ronnie Van Zant trick, and go barefoot on stage? I don't know about Ronnie Van Zant, but George has always gone barefoot. That's just the way he's always been, ever since he flew from Milwaukee out to Vancouver to join up with us. He was always in bare feet. And when we were in Toronto doing the album, he had to go to New York to do some interviews. He went to the airport in bare feet, and went on the plane in bare feet, got off in New York with bare feet–and he couldn't get into the CBS building in New York without his shoes. They wouldn't even let him talk to the receptionist [laughs]. Like there's armed guards there–they don't let any "weirdos" walk in. So they took a message up and someone came down and they went and bought him some shoes. And then he could go in and do his interviews. Is there any one particular theme or idea that you're trying to get across on the new album? Well the way we look at is just having a positive outlook on your life. Because, you know, you're born, and what can you do about it? Just get on with it. And we're not tellin' kids to go out and crank heroin into their eyeballs. You know, everybody's got problems, or bad habits. It's just like, "Hey, deal with it." That message runs pretty well through all the songs–like Welcome to the Club means, you know, "Hey pal, welcome to the human race."